You may have missed it, but today (Thursday, Oct. 12) is National Farmers' Day. The day originated back in the 1800s as a way to recognize and thank farmers for all the work they do to feed our nation--and the world. It's also time to thank a beekeeper. When beekeeper Kim Flottum of northeast Ohio, the 30-year editor of Bee Culture, addressed the recent Western Apicultural Society's 40th annual conference at UC Davis, he predicted that the nation's 250,000 beekeepers (who manage around 4 million colonies) will turn into a million beekeepers in five years. A million. We can only hope! Flottum applauded "the incredible rise of new beekeepers in the last 10 years." "The urban, surburban and country beekeepers are younger than the norm and we have more women beekeepers than ever," said Flottum, who launched the magazine, BEEKeeping, Your First Three Years, two years ago. "This isn't like the 1970s Green Movement--I'm old enough to remember that. It's got legs! But watch out for an ugly urban disaster like a major beespill or bad honey recall." Beekeepers are becoming more and more diverse, specializing in honey production, pollination services and queen bee breeding. Pollination services and queen bee breeding are the most profitable, Flottum said. Honey, not so much. "If I'm in beekeeping, pollination services is sure bet," he said. "Beekeepers now get 200 bucks a colony for almond pollination in California. Pollination is more profitable than honey. Bee breeding? Queens can sell for as much as $40 or $50." It's important for American beekeepers to label their honey "Made in America" or localize it by city or state, he said. Flottum also touched on such issues as honey bee health, nutrition, loss of habitat, poor quality forage, and pesticides. The varroa mite/virus is the No. 1 problem for beekeepers, he said. "Other stresses include nutrition, nosema, pesticides...All of these can be fixed with money, increased diversity of bee stock, and a move way from both ag and in-hive legal and illegal chemicals." Meanwhile, thankfully, the appreciation of honey bees seems to be growing. 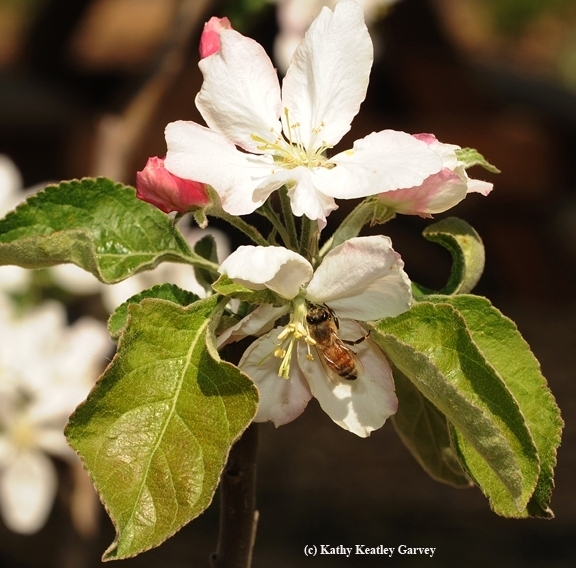 Brought here in 1622 by European colonists in Jamestown, Va., bees now pollinate about one-third of the food we eat. Happy Farmers' Day. Happy Beekeepers' Day. 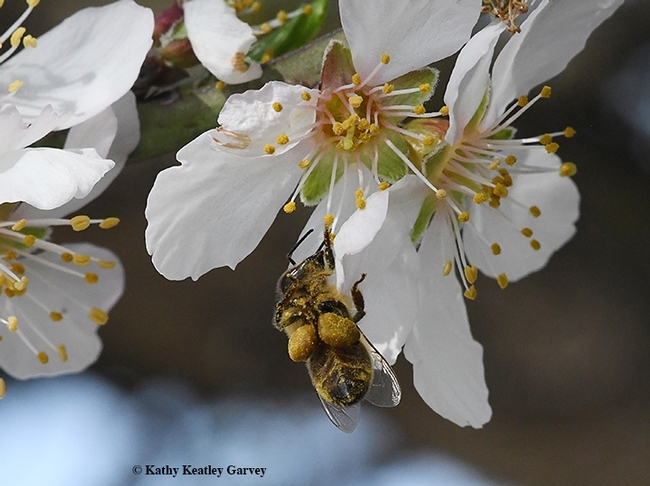 It's not a good time to be a California almond grower or a beekeeper. And it's definitely not a good time to be a honey bee. 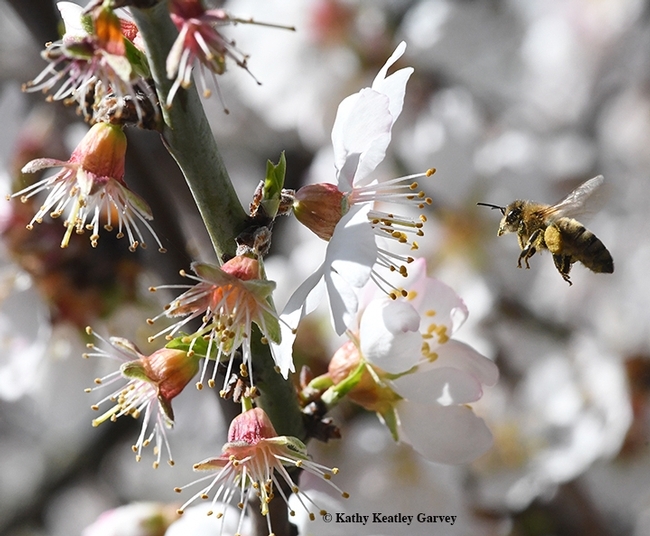 The wind-whipped storms that are ravaging California are wreaking havoc on the state's almond pollination season, says honey bee guru Eric Mussen, Extension apiculturist emeritus, UC Davis Department of Entomology and Nematology, and president of the Western Apicultural Society. The situation: California's million acres of almonds require two hives per acre for pollination. Without bees, no almonds. 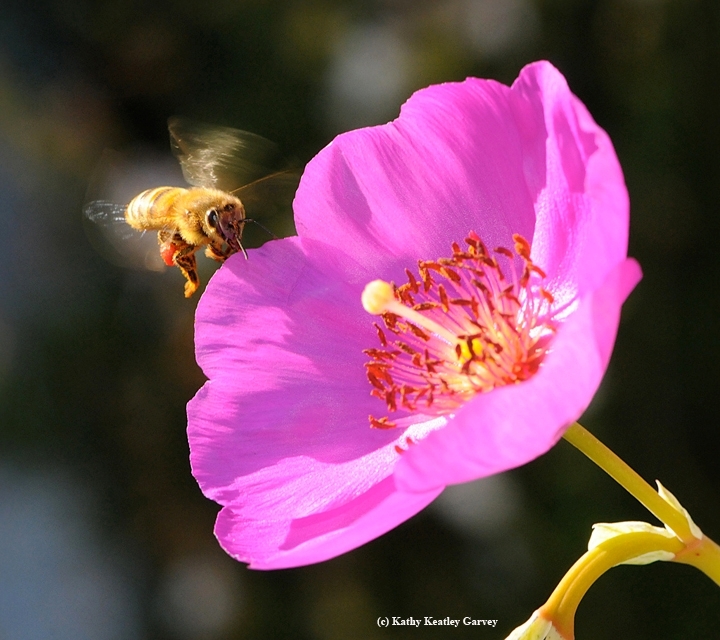 Honey bees usually fly when temperatures reach around 55 degrees. During inclement weather, they hole up inside their hives. They're so unlike our postal workers who vow that “neither rain, nor snow, nor sleet” can stop mail delivery. Unfavorable weather for bees? Think "no-fly zone." Mussen, California's Extension apiculturist for 38 years before retiring in 2014, continues to maintain an office in Briggs Hall, UC Davis, and respond to inquiries about honey bees. 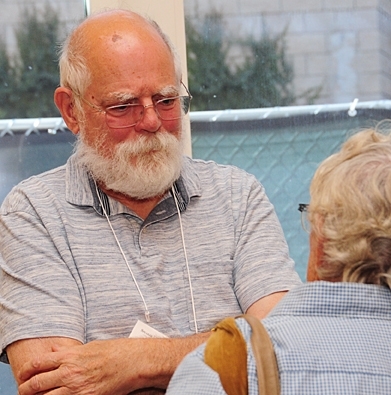 Not one to say "no," Mussen is serving a sixth term as president of the Western Apicultural Society (WAS), which was founded at UC Davis and gearing up for its 40th anniversary meeting Sept. 5-8 Davis. And the steady rain we're having? How will that affect the pollination season? Rain frequently is accompanied by cooler weather, which delays bloom. But, the delay can last only a short while, and then the flowers open and shed pollen, despite the weather. 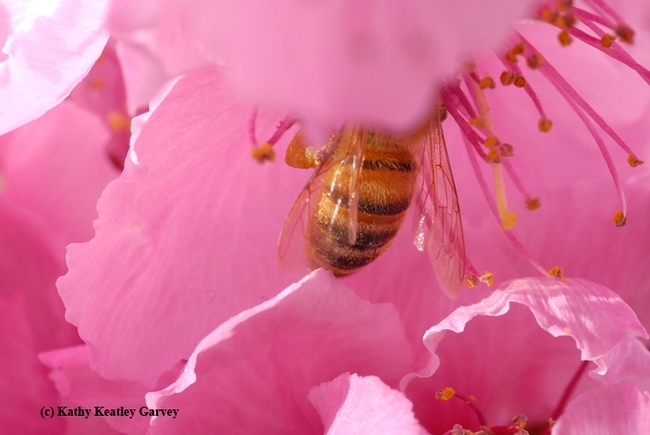 Honey bees usually neither forage on damp or wet blossoms, nor fly in the rain. If pollen grains come into contact with water, the water enters the openings in the pollen grains, through which the pollen tubes are supposed to emerge. The water is absorbed by the living protoplasm in the pollen grain and bursts its contents. Free water tends to transport spores of fungal, and sometimes bacterial, diseases to open flowers. Those microbes can invade the floral tissues, or in some cases, begin a journey through the flowers into the branches of the tree. When rain is imminent, growers usually will apply a fungicide to their trees to reduce the amount of infection. Frequent rains can promote multiple pesticide applications. By almond bloom time, honey bee colonies are collecting as much pollen as they can find, to feed an expanding brood nest. A prolonged period of inclement weather will interfere with nectar and pollen foraging, and leave little food to raise be brood. Lack of incoming pollens can reduce brood rearing, sometimes even to the point of the adult workers consuming most of the younger brood to save the nutrients for better times. Beekeepers who are used to seeing their colonies increase from 8-10 frames of bees to 10-12 frames during almond bloom may be disappointed this year due to a situation that is beyond their control. Providing supplemental feed can help their bees to a limited extent, but we have no supplemental feed that matches the nutritional value of mixed pollens. 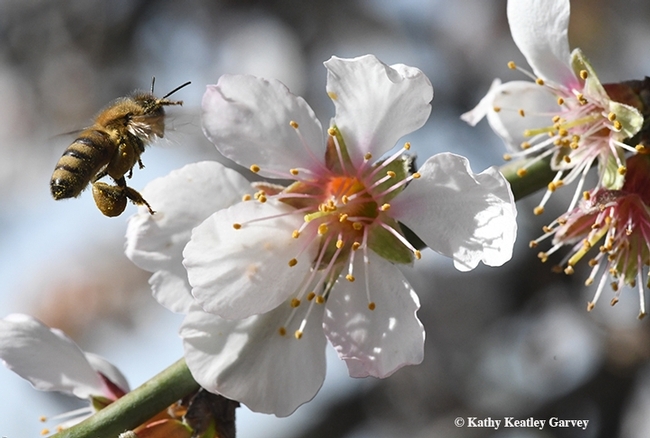 Bottom line: it's not a good time for almond growers, beekeepers, and bees. Pretty in Pink--And in Other Colors, Too! Well, not just pink. All other colors, too. It's National Honey Bee Day on Saturday, Aug. 20. That's when we officially celebrate the honey bee, Apis mellifera, which the European colonists brought to the Jamestown colony in Virginia in 1622. 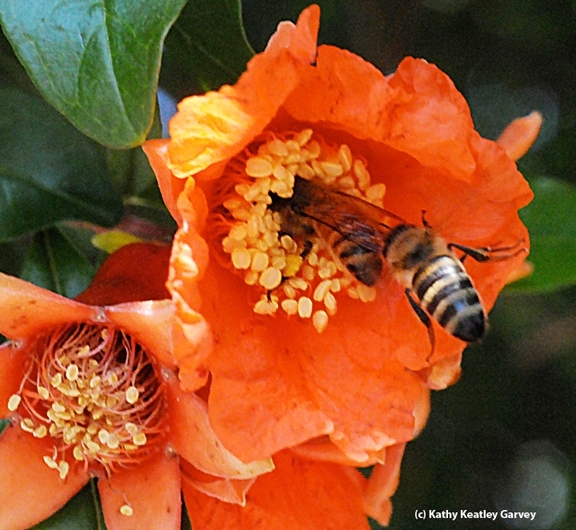 The honey bee didn't arrive in California until 1853 when a beekeeper brought colonies to the San Jose area. 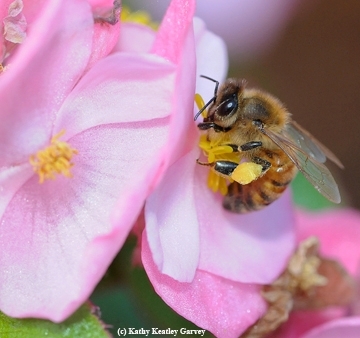 How did National Honey Bee Day originate? 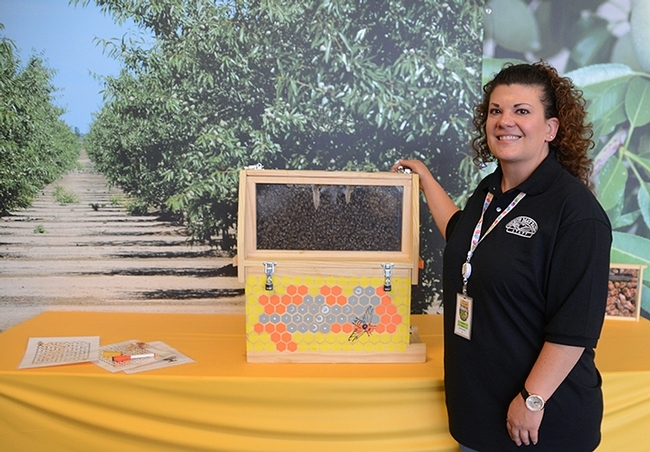 U.S. beekeepers launched the event in 2009. In fact, they petitioned the U.S. Department of Food and Agriculture to recognize and pay tribute to its smallest agricultural worker, to spread awareness, and to advance beekeeping. 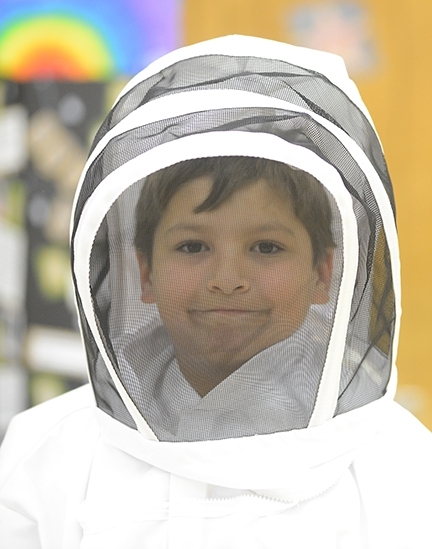 This year's theme: "Beekeeping: A Hobby with a Sweet Taste." When bees are out foraging, they bring back to the colony four essentials: nectar, pollen, water and propolis (plant resin that's used as a glue to seal small spaces). But that's not the only thing they bring back to the hive. They can also bring back pesticides that can kill or harm a colony. Just in time for National Honey Bee Day, the University of California Statewide Integrated Pest Management Program (UC IPM), affiliated with UC Agriculture and Natural Resources, has developed and published Bee Precaution Pesticide Ratings "to help pest managers make an informed decision about how to protect bees when choosing or applying pesticides." Cheryl Reynolds, senior editor/interactive learning developer for UC IPM, wrote a piece today on the UC Davis Department of Entomology and Nematology website about the project, first describing the UC IPM mission as "to protect the environment by reducing risks caused by pest management practices." "The bee precaution ratings are based on the reported effects of a pesticide's active ingredient on adult honey bees or their brood," Reynolds wrote. "You can find and compare ratings for active ingredients including acaricides (miticides), bactericides, fungicides, herbicides, and insecticides." "Ratings fall into three categories," she noted. "Red, or rated I, pesticides should not be applied or allowed to drift to plants that are flowering. Plants include the crop AND nearby weeds. Yellow, or rated II, pesticides should not be applied or allowed to drift to plants that are flowering, except when the application is made between sunset and midnight if allowed by the pesticide label and regulations. Finally, green, or rated III, pesticides have no bee precautions, except when required by the pesticide label or regulations." Reynolds emphasized that the bee precaution pesticide ratings "are not the pollinator protection statements on the pesticide label." "Each crop in the UC Pest Management Guidelines has links to the bee precaution ratings and provides guidance on how to reduce bee poisoning from pesticides," Reynolds pointed out. 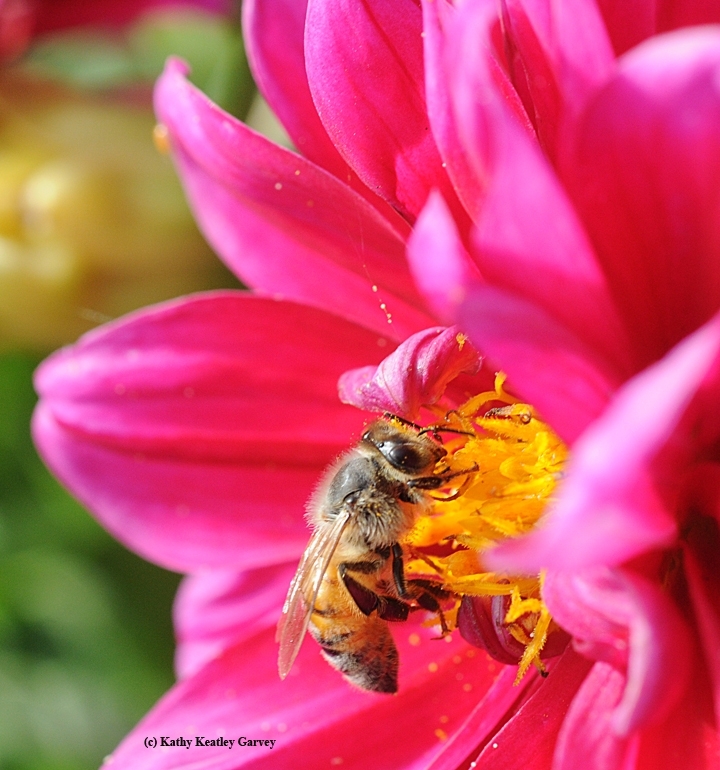 For more information on protecting bees from pesticides, access UC IPM's Protecting Natural Enemies and Pollinators, and use the Bee Precaution Pesticide Ratings. Meanwhile, Happy National Bee Day! Thank a bee! And if you want to become a beekeeper, UC Davis offers classes. If you attended the 141st annual Dixon May Fair, held May 5-8, and saw the honey bee display in Madden Hall, you probably heard the buzz. In keeping with the theme, "Buzzing with Excitement," bees buzzed in the bee observation hives as fairgoers singled out the queen bee, worker bees and drones. 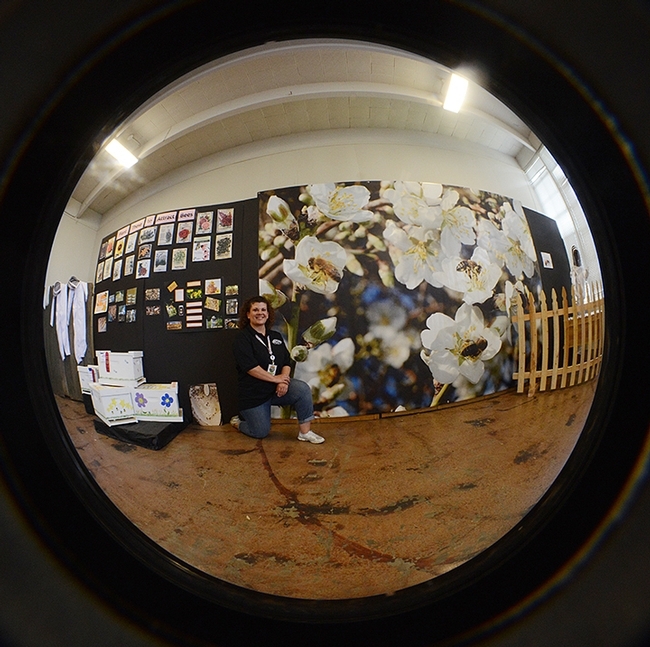 Images of bees pollinating almonds graced the walls. 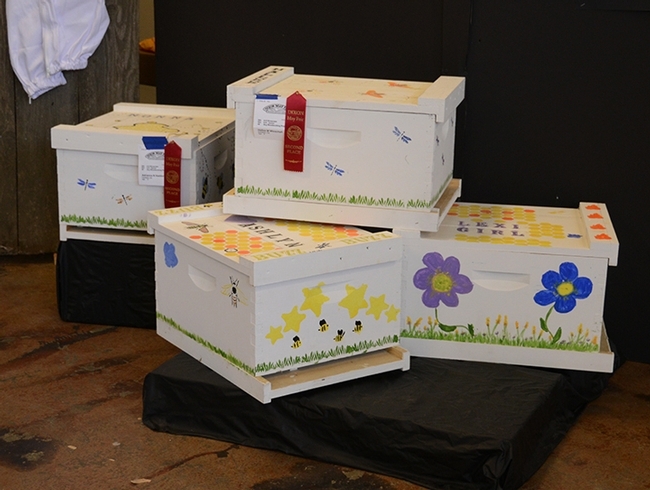 Youths in Garry Haddon's beekeeping project in the Vaca Valley 4-H Club, Vacaville, displayed their decorated boxes. 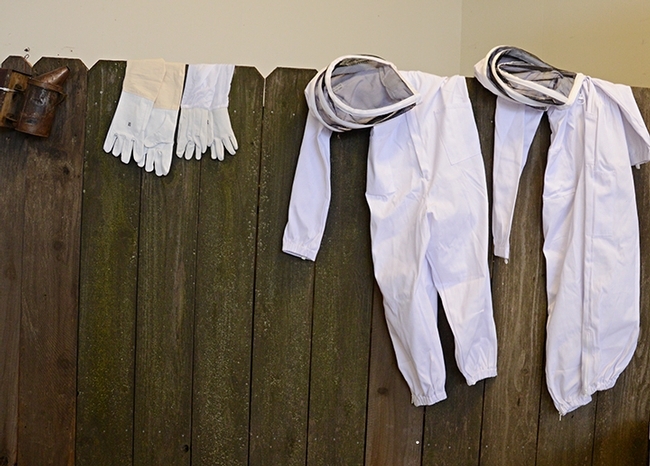 A smoker, gloves and beekeepers' suits lined a fence. 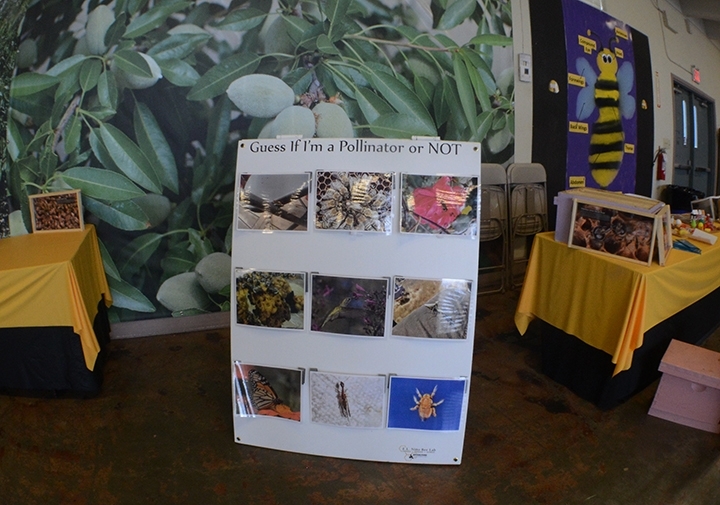 The UC Davis E.L. Niño lab, headed by Extension apiculturist Elina Lastro Niño of the Harry H. Laidlaw Jr. Honey Bee Research Facility, Department of Entomology and Nematology, shared beekeeping equipment, facts about bees, pollinator posters (Guess if I'm a pollinator or not?) as well as bee observation hives. They told fairgoers that bees are responsible for a third of the food we eat, and if there were no bees to pollinator our crops, we wouldn't recognize the produce section of our supermarkets. Most of the shelves and bins holding fruits and vegetables would be empty. Nathaniel Haddon of the Vaca Valley 4-H Club, Vacaville, is only nine years old, but he already knows more about honey bees than many adults do. He readily names the three castes: queen bee, worker bee and drone. He explains that the workers are all females, and that drones are males and they can't sting because they have no stingers. He knows how to tend a hive and he knows the importance of bee pollination. His father, beekeeper Garry Haddon Jr., of GLH Honey Bees, Fairfield, has kept bees for four years. Nathaniel talked about bees at the recent Solano County 4-H Presentation Day, held at Willis Jepson Middle School, Vacaville. 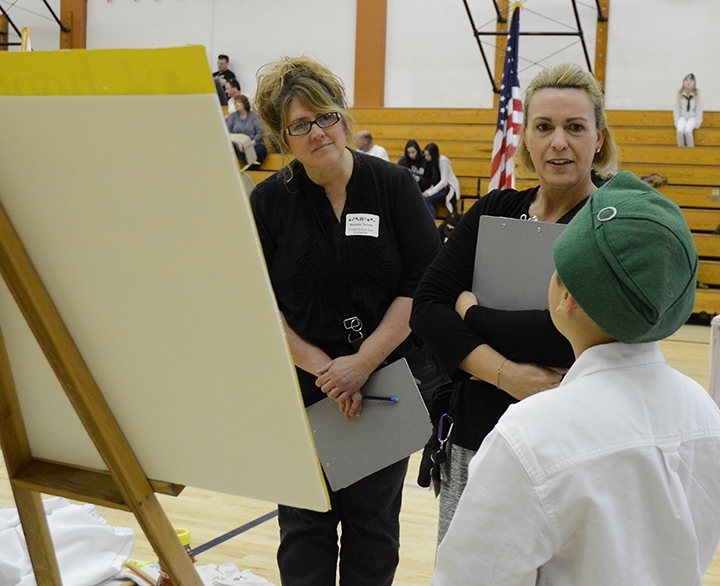 The annual event is an opportunity for 4-H'ers to share what they've learned in their projects, and to gain presentation experience. 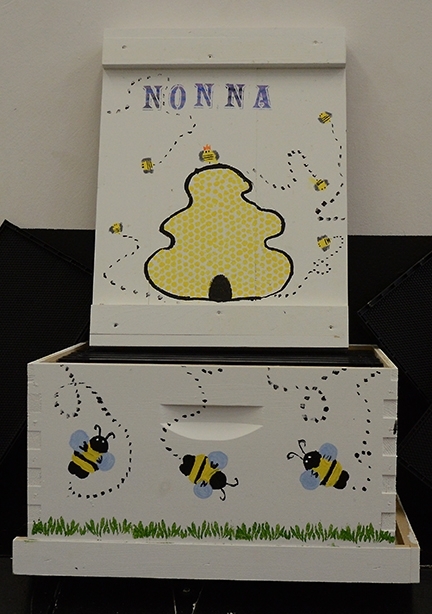 Nathaniel illustrated his hand-crafted poster, “Honey Bees,” with drawings of the queen bee, worker bee and drone; a drawing of the life cycle of a bee; and photos of him working the hives and holding a frame. 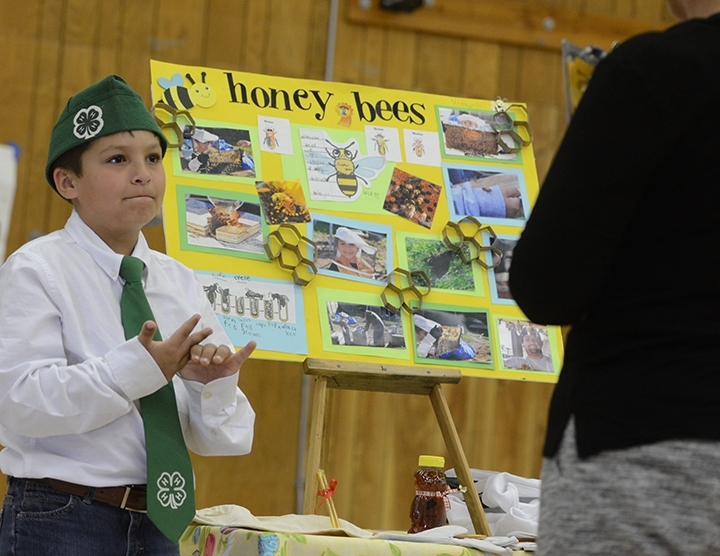 Nathaniel's display table included his bee suit, a bottle of honey, and honey sticks, which he shared with the adult evaluators Cara Kent and Brenda Torres. Following the presentation, we asked Nathaniel what he likes best about bees. “How drones can't sting,” he said. Learning about bees is lifelong. “I pass on the information I've learned to the kids,” Haddon said. 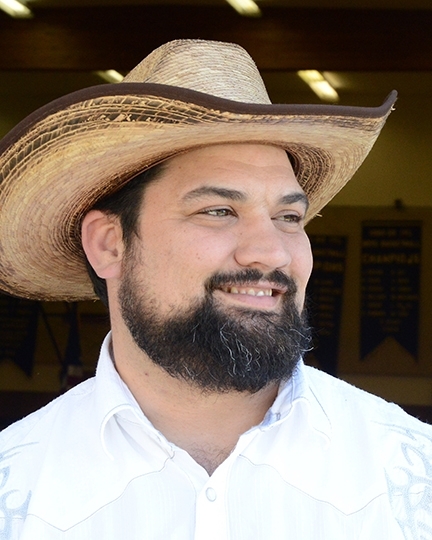 One of his mentors is beekeeper John Foster of John Foster Bz Bee Pollination Esparto. Garry hopes to take a course from the University of California, Davis soon. “The courses (taught by Extension apiculturist Elina Niño and her group) were already filled when I tried to sign up," he said. "I was on the waiting list. I'm looking forward to the next course offered." 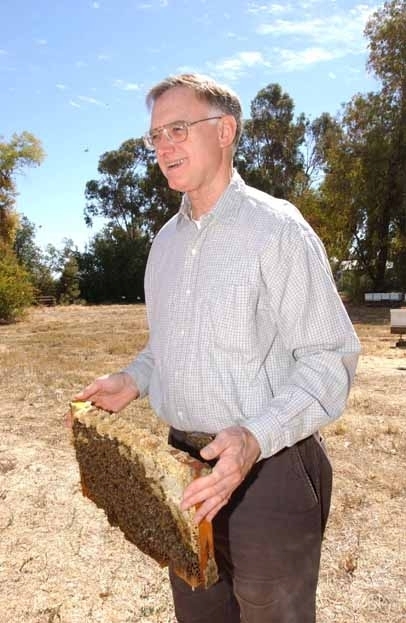 Earlier this year Garry trucked some of his bees to Turlock to pollinate the almonds. He bottles his honey and also produces honey sticks. He has not always been enamored with bees. “When I was in high school, I thought bees were pests,” Garry acknowledged. Not any more. He considers bees a treasure. Lately the 4-H beekeeping leader has been showing his project members how to build hives, and he encourages them to decorate their own hive, "to make it their own." Three 4-H'ers, Ashlyn Haddon, Adrianna Haddon and Hallee Winchell, displayed their decorated hives at the Solano County 4-H Presentation Day. The 4-H Youth Development Program is a non-profit youth educational program administered through the UC Cooperative Extension. In 4-H, youths from ages 5 to 19 learn skills through hands-on learning and have fun doing it, said Valerie Williams, Solano County 4-H program representative. The international organization draws youth from all ethnic, racial, and socio-economic backgrounds who live in rural, suburban, and urban communities. The four H's in 4-H stand for head, heart, hands, and health. The motto: "To make the best better." 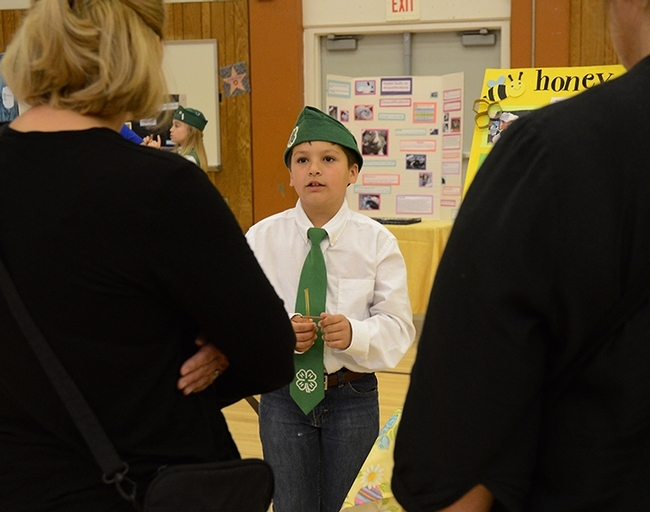 Age-appropriate projects within each club are the heart of 4-H's hands-on learning. Each project focuses on a topic, anything from A (art) to Z (zoology). Among the many projects: animal sciences, bicycling, camping, computers, drama, entomology, leadership, music, photography, quilting, rocketry, textile arts, and woodworking. For information on the Solano County 4-H Program, access http://cesolano.ucanr.edu or contact Valerie Williams at vawilliams@ucanr.edu or (707) 784-1319. 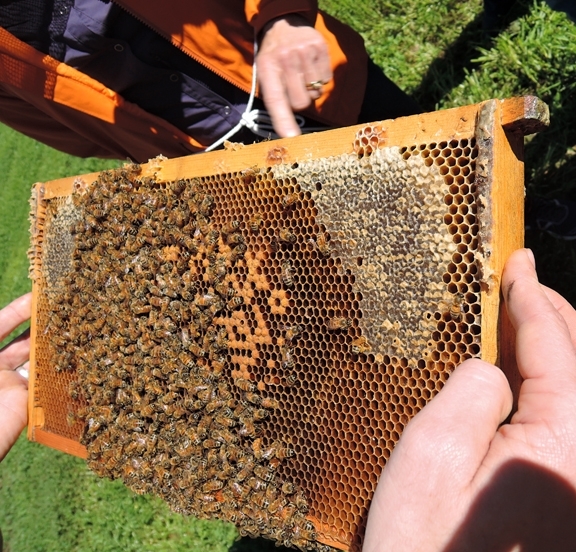 For more information on UC Davis beekeeping courses, contact the E.L. Nino lab at 530-380-BUZZ (2899) or access the website at http://elninobeelab.ucdavis.edu/ and Facebook at https://www.facebook.com/elninolab.